The students from the Faculty of Fine Arts, who have been protesting since January 31, have also alleged Hafeez Ahmed of irregularities in marks distribution based on favouritism. 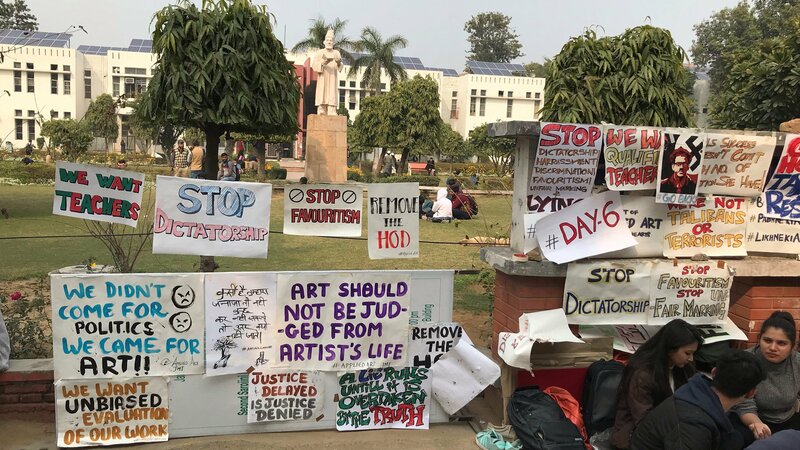 The gate number 7 of Jamia Millia Islamia seems quite busy these days with over a hundred women students studying Applied Art from the Faculty of Fine Arts, who have gathered at the gate to protest against a professor since January 31. The women are alleging that the Head of Department (HoD), Hafeez Ahmed has been misbehaving with female students and passing lewd comments. The students have also alleged that they have been facing irregularities in marks distribution based on favouritism. Another allegation levelled on the professor is that of labelling Kashmiri students as terrorist. In the past too students have written to the Dean of Students' Welfare (DSW) and concerned officials but till date the university administration has not taken any action against him. The protesting students are demanding immediate suspension of the HoD, a safe campus and open marking system like other departments. Rathore added, "We demand a safe campus for female students and a fair marking system. Graphics is one of our main subjects, but unfortunately we do not have a teacher who can even point us our drawbacks." Yunus Nomani, who was busy making placards in the middle of the protest told NewsClick, “Recently, I went to his chamber to seek permission regarding a workshop on paintings which was conducted by a Kashmiri who had come from Manchester. Instead of giving permission, he asked me to stay away from Kashmiris. According to him, they collect people and influence them by their terrorist ideology. He also has problems with Biharis. NewsClick also approached the HoD but he refused to comment saying that there is university protocol and it is better to speak to the administration. He also slammed the protesting students for staging a “fabricated” protest.